April 1937. 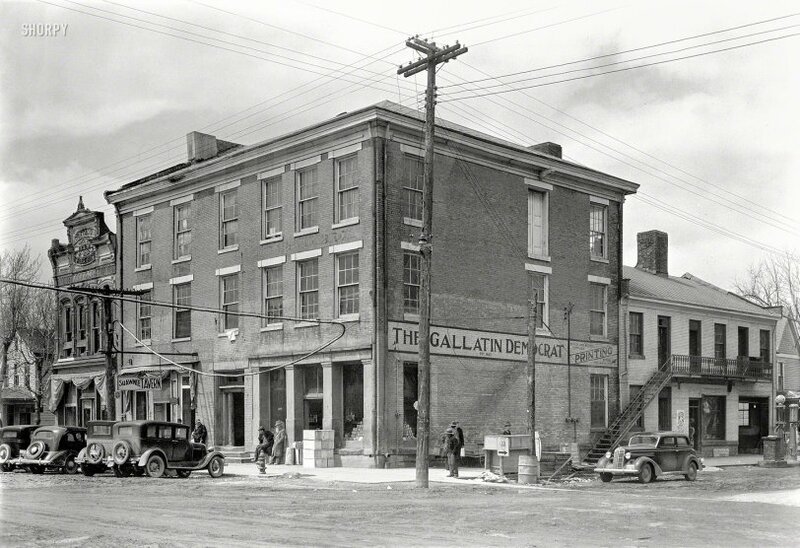 "The Posey Building of Shawneetown, Illinois, in which Abraham Lincoln and Robert Ingersoll had law offices." Now home to a newspaper and a bar. Photo by Russell Lee for the Resettlement Administration. View full size. Submitted by BIBBERWIBBER on Thu, 10/29/2015 - 12:50pm. It looks like the hydrant in the old photo and the one in the Google street view are one and the same. Submitted by stuart51 on Thu, 10/29/2015 - 10:59am. When I lived in Southern Illinois in the 60s and 70s, most of the buildings along Main Street were still standing, although not in the best condition. I recall that most of them seemed to house a bar. Old Shawneetown was known as a hard-drinking very rough place. The denizens were commonly referred to as river rats. The decline began after the flood of 37 (which Russell Lee's photographs are documenting) and the Federal government paid to resettle the town on top of the bluff above the Ohio River, today known as New Shawneetown. Today there are only a couple of old downtown buildings still standing. One, the state bank building, shown recently in another Russell Lee shot, is an Illinois Historic site. The exterior is still in fairly good shape, or at least was when I last saw it about 4 or 5 years ago. The interior, unfortunately is crumbling lath and plaster and murals. You cannot go inside. The other major building still standing, on the levee side, is now a big regional biker bar called Hog Daddy's. When was it torn down? Submitted by twaits on Thu, 10/29/2015 - 6:22am. Does anyone know when or why it was torn down? Seems like such a historic building should have been preserved. Or maybe the flood took its toll on it. Is that the high water mark I see? Submitted by karenfryxell on Thu, 10/29/2015 - 5:53am. Fred Murphy is the editor of the Gallatin Democrat. There's no website for the paper though. Submitted by alexinv on Wed, 10/28/2015 - 7:35pm. According to Wikipedia, Shawneetown was heavily damaged by the Ohio River Flood of 1937, and the townsite was moved three miles inland and the town rebuilt. From the age of the buildings here, this must be what is now called Old Shawneetown (refer to the previous picture posted here for another building destroyed by the flood). The county seat is now in what is informally called New Shawneetown. Submitted by MaltedFalcon on Wed, 10/28/2015 - 3:16pm. Submitted by kozel on Wed, 10/28/2015 - 12:15pm. These steps are all that remain of the Posey Building.